We went to Koh Samed island for the weekend. It was about 2 and a half hour bus drive from Bangkok. After getting off the bus, we had to take a boat to get to the island. The fees for the entrance to the national park was 20 bahts for Thai nationals and 200 bahts for foreigners. We pretended to be Thai and got away with paying 20 bahts for each. We had a hard time getting a room for seven of us. There were a lot of tourists there. After cruising through the island for about 2 hours, we managed to get a small room for Bahts 1,700. It was a small guest house. We had fun swimming. At the restaurant we met Ma Nge, who was also from Mudon, Mon State, Burma. She has been in Koh Samed for about five years, working as a baby sitter. We also met a few more Burmese people who have been working here for many years. 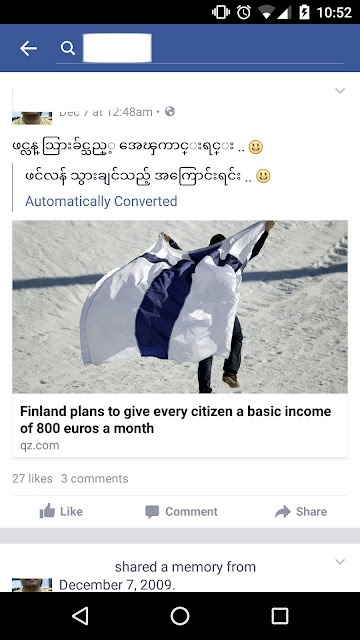 One of them said they could live more freely and work, earning decent income compared to Burma.